Communion petticoat for girl made in tul with a ruffle at the bottom. It comes with two hoops to make the shape and the properly volume for our communion dresses. You will receive both hoops but you can choose if you prefer to use one hoop or two deppending on the volumen you want to get. SKU: CA-CAN-AROS Category: Petticoats. Tags: communion petticoat, communion petticoats, petticoat communion, petticoat for communion. 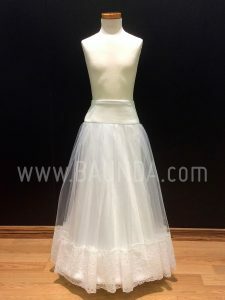 Description: communion petticoat for girl made in tul with a ruffle at the bottom. 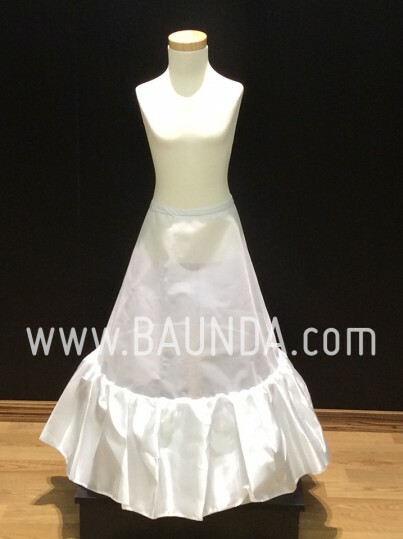 It comes with two hoops to make the shape and the properly volume for our communion dresses. 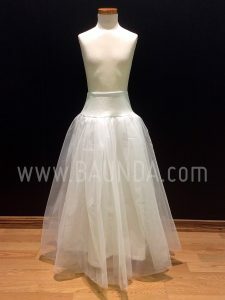 – If you have bought the dress with us, just select the colour and the size you consider: together with the girl measurements we will ensure it fits her perfectly. – Imprescindible for the girl to wear the communion petticoat under the dress to make the skirt shape look great.